As part of the Mods 2.0 update, a new tier of mods – 6E – was added. 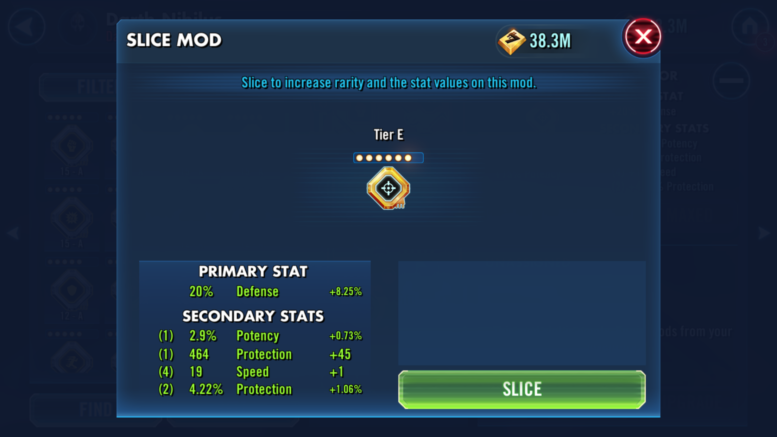 This new tier, which is obtained by slicing high end mods, gives a nice boost to each stat on a mod, and will make a significant difference as the game progresses. However, slicing to 6E is expensive, and involves a significant amount of farming, especially compared to how many characters there are to mod. Because of this, it’s important to make an informed decision and to look for lasting value. Although speed is essential, and even a small increase can make a difference, it shouldn’t be the only factor in this decision. Speed increases are universal when slicing to 6E – +2 for a primary, +1 for a secondary. If you’re only worried about speed, then Speed Arrows are the clear winner, but the other primary and secondary stats have much bigger increases, and should be the deciding factor. Looking at primaries, and remembering that Mods 2.0 was based around improving balance, there are some which are clearly better choices than others. It’s important to re-evaluate which stats are important when looking at which mods to slice first, as different characters will benefit more from different stats now – where a 23.5% protection primary was almost always better than a 5.88% health primary before, the difference between 24% protection and 16% health is a lot smaller, especially once you look at whether the team has healing, bonus protection, etc, or not. Secondary stats have the same considerations as primaries – how big the increase is, and how important the stat is. But, it’s also important to look at how high the secondary stats are, since the increases are percentage based rather than flat. It’s worth noting that speed appears to always round up, while everything else rounds normally. Just like primaries, there’s a lot of variation between the different stats, with the already higher, or clearly better options gaining less. This is especially true when comparing flat stats, like health and protection, to their percentage based counterparts – the percentage based stats have historically been lackluster in comparison, but the higher increases brings them in line, and makes them much more attractive. Does it have a good speed secondary? This will always be important, and not having speed will severely reduce how useful it is for most characters, so it should still be the first thing to look at. Is the set bonus useful? Especially after the rebalancing done by Mods 2.0, it’s worth looking at the set bonus when making this decision. While every set has it’s place, and can be useful, some are still better than others. Is the primary stat useful? Primary stats are too important to ignore, and play a massive part in whether a specific mod is good for a specific character. Choosing a mod with an undesirable primary stat will just lead to dissapointment later on. How much does the primary stat increase? Focusing on slicing mods with high increases to primaries will give you the biggest boost, and the biggest advantage. Protection is an especially bad choice – the most any character will gain from a 0.5% increase to protection is 237, which is a ridiculously small amount. Are the higher secondary stats useful? Just like the primary stat, which secondary stats are on a mod matters. If none of the secondary stats are desirable, you won’t use the mod long term. The same applies to which secondary stats rolled when you upgraded the mod – if the useful stats didn’t roll, it’s going to be replaced quickly. How high are the secondaries, and how much do they increase? Since secondary stat increases are percentage based, the size of desirable secondary stats should be an important factor, as well as the size of the increase. High stats with a small increase won’t end up much higher, and neither will low stats with a big increase. Prioritizing high, desirable stats that have high increases will maximise your gains. Does the mod standout as being better for a specific role? The best mods are ones that are clearly better for a specific role. A Crit Damage mod with an offense primary, but high health and defense secondary stats isn’t nearly as good as one with damage based secondaries. Modding SWGoH characters is all about increasing the important stats, so a mod that’s got a good combination for whichever role you’re looking at is more beneficial than one which doesn’t. Will I use this mod? Regardless of how good it looks on paper, some mods just wont be used. Whether it’s because you have something better, or it’s missing something important, or you just plain don’t like it. So it’s important to make sure you’ll actually use the mod. Overall, the best mods for slicing to 6E are those with the biggest increases, and lasting value. The absolute best way to judge it is to bust out a calculator, and check exactly where the stats will be after slicing it, and deciding whether it’s a big enough boost based off that. Not everyone cares enough, or is willing to do that for a game though, so simply asking the questions I laid out above should still lead to good decisions. We’re hard at work updating our Best Mods series to best reflect how to best mod each character post Mods 2.0 release, and there are also guides on how to calculate gains from mods, how to calculate effective health, how to check whether crit damage or offense is better, and even how armor and defense works, all of which can be used to make a more informed decision. Above all else though, make sure you’re happy with your decision. Just like Zetas, it’s a very subjective topic, and a slice one person thinks is perfect, could be one another person regrets. And for an investment this big, you don’t want to regret it. Be the first to comment on "SWGoH: Mods 2.0 Tips for Slicing Mods to 6E"